Judith Lown announces the publication of her newest novel! Boston Tangle: Regency Comes to America, my third Regency romance, is a sequel to A Match for Lady Constance, and includes an important character from A Sensible Lady. Boston Tangle tells the story of Drusilla Fortesque, best friend of Lady Constance Hatton. Heartbroken after a bitter parting from the man she loves, Drusilla eagerly accepts an invitation from her Uncle Derrick and Aunt Camellia of Boston to be a support and companion to her cousin, Ivy, as she prepares to enter society. In America, Drusilla finds fascinating new friends and acquaintances. But leaving England is one thing, forgetting her lost love is quite another. An enigmatic Englishman seems to understand her dilemma. Then, her old love walks into Aunt Camellia’s parlor. The worlds of A Match for Lady Constance, and A Sensible Lady, meet in Boston, creating a tangle that Drusilla Fortesque must undo to find happiness. 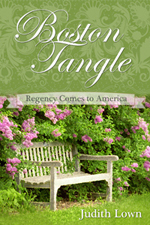 "If you’re looking for a “sweet,” “traditional” Regency romance, I highly recommend Boston Tangle: Regency Comes to America . I read it with pleasure, not just because a friend wrote it, but because it is a genuinely delightful book and a welcome addition to the modern “Regency romance” canon." by the Bookworm, October 29, 2015. Read the complete review. Writing is a solitary occupation. I suspect that any individual writer’s process is as unique as a fingerprint or snowflake, which serves to enhance the writer’s sense of isolation. But there are commonalities in the challenges and dilemmas that writers face—across genres. And there are questions and expectations that readers have. It would be fun to have long conversations with other writers, aspiring writers and readers. But it’s not possible—for me, at least—to write and talk, too. So I’ve solved this problem in the way that comes most naturally to me—by writing. I hope you’ll join in the conversation. Or, if you’re even more of an introvert than I am, I give you my blessing just to read.